Open every day noon-11.30pm. All major credit cards accepted (not Amex/Diners). 10% service charge for parties of 6 or more. 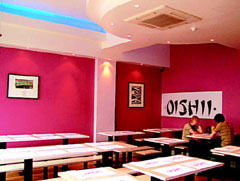 In addition to a range of Sushi, Sashimi, Noodles and Rice there is also a choice of Sirloin Steak, Duck in Orange Sauce, Salmon Steak in Teriyaki Sauce and Seafood in Malaysian Hot Sauce.